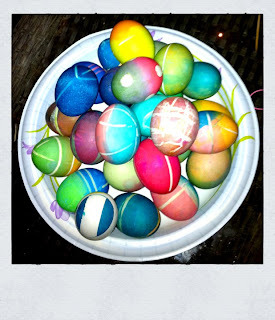 The Advent of TUF: When Going Gets TUF, the TUF Dye Eggs! When Going Gets TUF, the TUF Dye Eggs! i had the great fortune of attending a party this past friday with some friends who are already Totally Urban Farmers. more about that in the next post, but i first must expound upon the benefits of hanging out with really fun people. this party had an egg-dying component which had been casually mentioned in the invite, and after some drinks had been partaken and dips enthusiastically consumed, the partygoers agreed that the time for eggs had come. 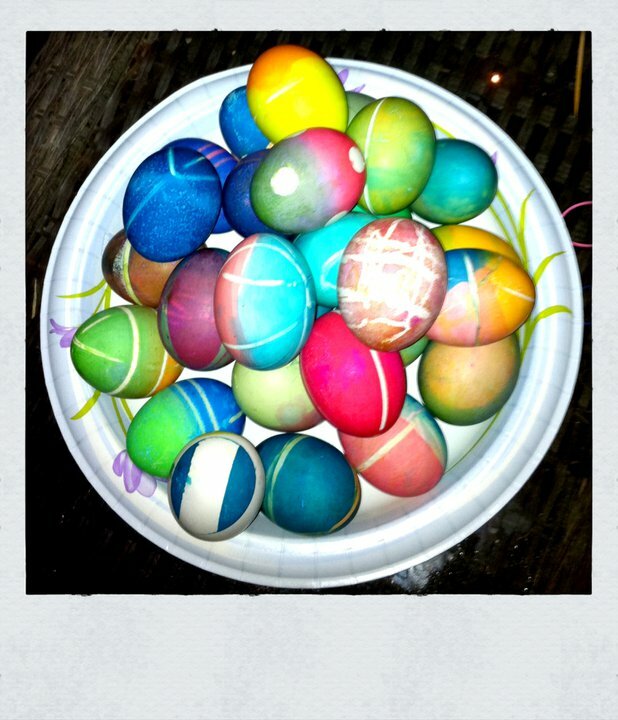 out came the traditional PAAS brand egg dying packages, with the tiny dye tablets that look like some kind of illicit drug, and soon the nostalgic scent of warm vinegar fizzing with vibrant color mingled with hard boiled egg-roma in the air. some rubber bands were procured for egg tie-dying, a crayon was searched for in vain, egg stickers were organized, and the dying began. the picture doesn't do justice for the true beauty of the eggs. at this point, of course, an objective judge was necessary. so some late-coming party attendees were informed of their duty as soon as they arrived. after much serious consideration, discussion, egg handling and artistic analysis, the judges gave each artist the chance to defend their egg in one of three ways: 1) discuss the inspiration for the colors and design; 2) do an interpretive dance reflecting the artistry of the egg; 3) name (and bonus: sing!) an 80's song that best represents the egg's essence. the winner would receive first crack at the pinata. yes, there was also a pinata at this party. i am pleased to report that, in a kind of upset, dan and my egg won the judges' favor after we chose to represent it by doing a rousing rendition of ToTo's "Africa (I Bless the Rains Down in)." i gave the first shot at the pinata to the first runner-up egg, which had been the victim of a possible sabotage attempt, and which had undergone the most creative dye process (involving a huge amount of hemp twine and a stint in the garbage can). the pinata was destroyed, candy was collected, party goers dispersed happily. before the competition, many of us had been strangers--at the end of the evening, everyone agreed that we were now "friends for life" after all the egg bonding that had occured. it was a good friday party to end all good friday parties.